Despite terrible road conditions due to the overnight snow, we made it down to Akron on Sunday morning for the Divine Liturgy at Holy Ghost Ukrainian Catholic Church. 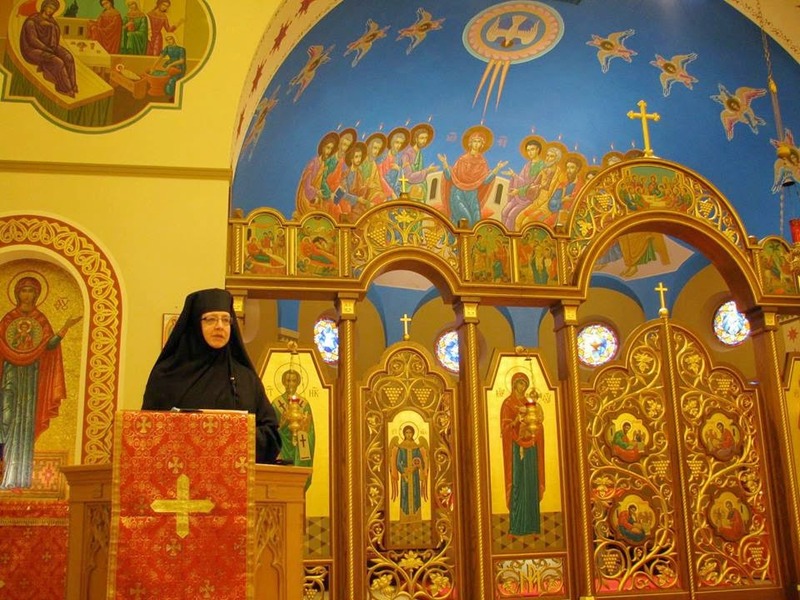 Mother was invited to speak after the Divine Liturgy about fasting. During the brunch, Moki shared her vocation story with the parishioners. 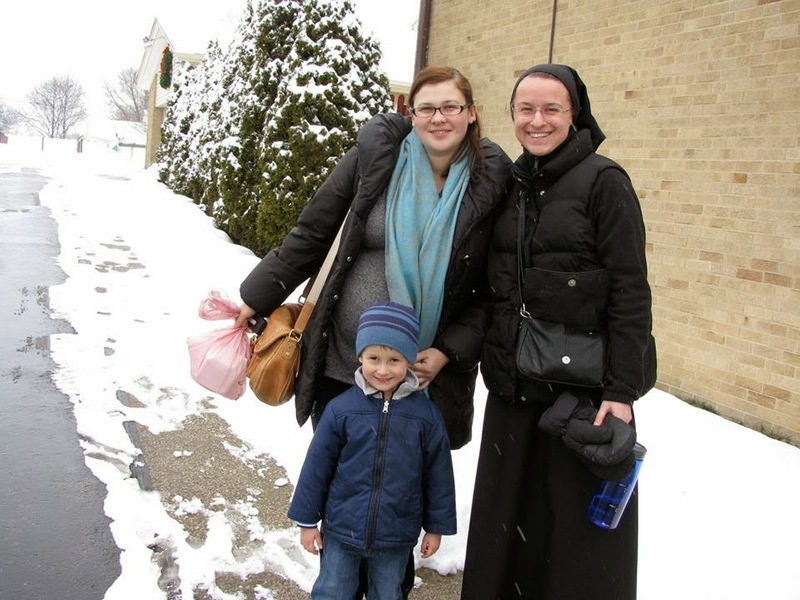 We were welcomed with the greatest hospitality by the loving parishioners! Their pastor, Fr. Vsevelod ("Fr. Sal") Shevchuk is the brother of Patriarch Sviatoslav Shevchuk, Major Archbishop of the Ukrainian Catholic Church. Fr. Vsevelod's wife is due any day now with their second child! Please pray for this beautiful parish as they celebrate their 100th anniversary. “We waited, and at last our expectations were fulfilled. When the Patriarch sang 'Christ is risen,' a heavy burden fell from our souls. We felt as if we also had been raised from the dead. All at once, from all around, the same cry resounded like the noise of many waters. 'Christ is risen' sang the Greeks, the Russians, the Arabs, the Serbs, the Copts, the Armenians, the Ethiopians one after another, each in his own tongue, in his own melody…Coming out from the service at dawn, we began to regard everything in the light of the glory of Christ’s resurrection, and all appeared different from what it had yesterday; everything seemed better, more expressive, more glorious. Only in the light of the Resurrection does life receive meaning." This experience of resurrection joy is foundational to our worship and is the root of our Christian life and hope. Yet if we are to experience the beauty and power of the Resurrection, each of us needs to go through a journey, a time of preparation and waiting. Without going through this journey of waiting—of expectant preparation, the deeper meaning of the Easter celebration will be lost. In others words, if we do not die, we will not resurrect. Fasting is a way of emptying ourselves in order to be filled with God. The purpose of fasting is also to discipline ourselves and to gain control of our passions. The soul is strengthened through self-denial and grace. We as human beings, made in the image and likeness of God, are body and spirit. Our spirit could not express itself without the body and the body is alive and animated by the spirit. Since we are a synthesis of body and spirit, both the body and spirit need to go through this time of preparation and be attentive not to neglect one or the other. “The value of fasting does not consist in abstinence only from food, but in a letting go of sinful practices, since he who limits his fasting only to an abstinence from meat is he who especially demeans the fast. Do you fast? Give me proof of it by your works. If you see a poor man, take pity on him! If you see a friend enjoying honor, do not envy him. For let not the mouth only fast, but also the eye, and the ear, and the feet, and the hands, and all the members of your bodies. Let the hands fast by being pure from greed. Let the feet fast by ceasing from running to forbidden spectacles. Let the eyes fast by being taught never to fix themselves rudely upon handsome countenances…For it would be an instance of the highest absurdity to abstain from meals and from unlawful food because of the fast, but with the eyes to feed on what is forbidden. Do you not eat flesh when you feed on immorality by means of the eyes? Let the ear also fast. The fasting of the ear is not to receive evil speaking and slander. Let the mouth also fast from fowl words. There needs to be a proper balance between the body and the spirit. St. Paul tells us in his first letter to the Corinthians, “Your body is a temple of the Holy Spirit…glorify God with your body” (1 Cor. 6:19-20). Without physical abstinence a full and true fast cannot be kept; yet we have to be careful not to treat the rules about eating and drinking as an end in themselves. Ascetic fasting always has an inward and unseen purpose. The primary aim of fasting is to make us aware of our helplessness and dependence on God. We experience hunger, thirst and physical strain in order to lead us to a sense of inward brokenness and repentance. Through fasting and prayer we realize, in a profound way, the words of Jesus, “Without Me, you can do nothing” (Jn 15:5). If it is important not to overlook the physical requirements of fasting, it is even more important not to overlook its inward significance. If we disregard the spiritual aspects of the Fast, then fasting without prayer becomes a mere diet. And...prayer and fasting without works of charity is dead. The gospel of the Paralytic has a message of perseverance and hope. The paralytic was unable to get to Jesus because of his condition and the crowd. The friends of the paralytic overcame the obstacles that were in the way of their love for their friend. The gospel says, "Jesus saw their faith..." It was through their faith that the paralytic was healed. We, through our faith, through our prayer, fasting and almsgiving can bring others to Christ and overcome obstacles of spiritual paralysis or anything that separates them from Christ. Fasting makes us light, vigilant, free and joyful. In time, it actually makes us work more diligently and think more clearly. When we over eat and drink we can become complacent and self-reliant. We become spiritually sluggish and our well-meaning intentions to pray or exercise an act of almsgiving can yield to compromise. Our opportunity to spend intimate time with God, a loved one or someone in need may ultimately end in a fruitless enslavement with something like a Smartphone. The real test actually comes after your first failure. If after having failed in your efforts, you start all over again and do not give up no matter how many times you fail, sooner or later your fasting, prayer and almsgiving will bear spiritual fruit. Be patient with yourself. There are no shortcuts to holiness (other than martyrdom!). We have 5 more weeks--35 more days--of fasting, prayer and almsgiving. We have 35 more days of preparation and waiting, waiting for our expectations of the resurrection to be fulfilled. Along with fasting, I do my best to live out the seven Corporal Works of Mercy during this great fast season . It really does help me when I am helping others in this way.